One of the problems with ICANN meetings is that so much goes on that it is impossible for people to keep track of it all. I am especially aware of this as (in my role as general manager of public participation) I have been trying to developed a way to let people know simply and easily what has happened. What I have come up with is a daily conference newsletter, provided each morning that outlines the main meetings of that day alongside short summaries of what happened the previous day. These are handed out at the conference – left at the registration desk, the ICANN booth and on chairs in the main rooms. 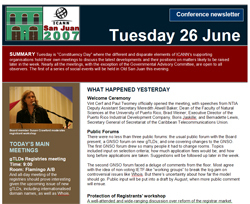 They are also provided as pdfs on the San Juan meeting website at http://sanjuan2007.icann.org. Here are the links to the pdfs for today, Tuesday 26 June [pdf] and yesterday, Monday 25 June [pdf]. Any comments on the format or approach are welcome.